This variety of the herb is a deciduous perennial plant which normally grows to reach a height of about a foot or 30 cm when fully mature. 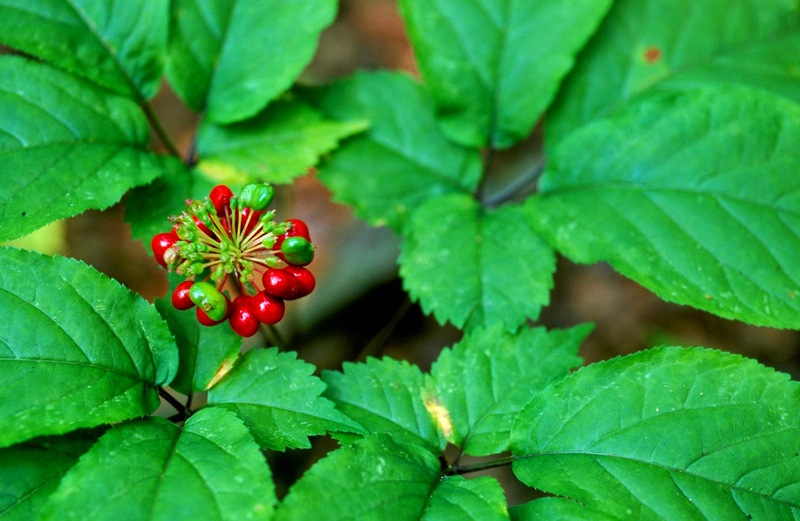 The American ginseng is characterized by having oblong to oval leaflets borne on a smooth stem; the plant also bears a large number of small and greenish colored flowers, and gives out scarlet berries which are peculiarly kidney shaped in structure. 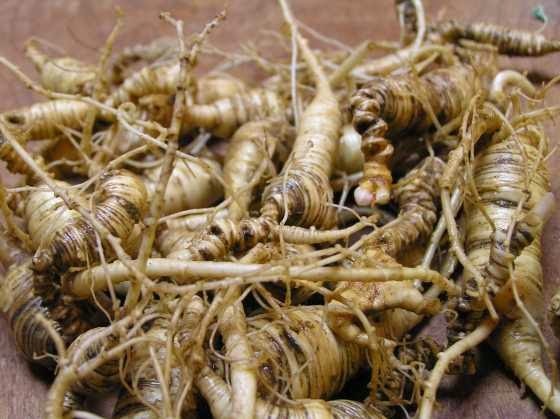 American ginseng root is one of the most prized herbs in the world and is believed to have health-improving elements. In fact, it is most revered in China, even though an almost identical herb, called Asian ginseng, is native there. American ginseng has been traditionally used to negate the effects of fatigue and stress. It’s often used as a general health tonic to enhance a person’s mental and physical performance. Among the active compounds in American ginseng are ginsenosides, which promote energy by supporting blood sugar metabolism. Other chemicals, called polysaccharides, have been shown to support immune system function. Milder in its effects compared to the Chinese variety, the American ginseng is still though to posses a similar beneficial action such as that possessed by the Chinese ginseng and it is used in all herbal roles in which the Chinese variety is normally utilized. The tolerance of the body to any stress is increased markedly by taking the American ginseng. The main role of the herb is as a yin tonic in the traditional Chinese system of medicine, it is used primarily in the treatment of physical weakness in the body of patients, in the treatment of conditions such as fever, in treating wheezing, and in the treatment of coughs in affected patients. The root of this herb possesses cardiotonic, adaptogen, panacea, demulcent, sialagogue, tranquilizing, stomachic and tonic properties. Generally, American ginseng is recommended for treating conditions like exhaustion owing to persistent consumptive disease, impulsive perspiration or sweating during the night and low-grade fever. It is believed that taking this herbal remedy for a prolonged period of time helps to enhance physical performance and mental efficiency, at the same time assisting the body to adjust to stress and low or high temperatures. 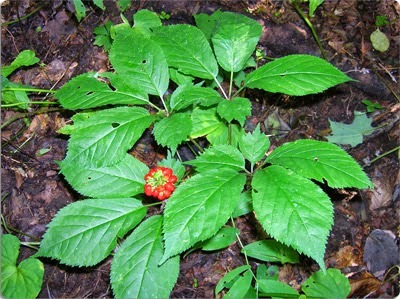 American ginseng is used for stress, to boost the immune system, and as a general tonic and stimulant. American ginseng is used for other infections including HIV/AIDS, infections of the intestine (dysentery), and particular infections (Pseudomonas infections) that are common in people with cystic fibrosis. American ginseng is also used for low iron in the blood (anemia), diabetes, nerve pain, erectile dysfunction (ED), fever, hangover symptoms, attention deficit-hyperactivity disorder (ADHD), blood and bleeding disorders, cancer, painful joints, dizziness, headaches, convulsions, fibromyalgia, “hardening of the arteries” (atherosclerosis), memory loss, and as an anti-aging aid. However, it is advisable that people using American ginseng for their conditions should take some precautions, because taking this herb in excessive dosages may result in high blood pressure (hypertension). American ginseng also has the aptitude to invigorate as well as unwind the nervous system, enhance stamina/ endurance, promote hormone secretion, reduce the levels of blood sugar as well as cholesterol, and also fortify the immune system against diseases. This herb is also taken internally to treat conditions related to ailments and/ or old age, loss of appetite, stress, insomnia, persistent ailments and even shock. The ginseng is one of the safest herbs for supplemental use, and when taken at the recommended dosages, safety is almost guaranteed. There are a few exceptions and in some individuals over stimulation of the body can result in rare instances, insomnia is another possible side effect in those using the herbal extract at extremely high doses. The risk of disturbing the gastrointestinal system and over stimulation of the body substantially increases when people consume caffeine with supplemental ginseng - this practice is not recommended. Ginseng should also be avoided by all individuals who tend to suffer from uncontrolled high blood pressure problems. Diabetes: American ginseng might lower blood sugar. In people with diabetes who are taking medications to lower blood sugar, adding American ginseng might lower it too much. Monitor your blood sugar closely if you have diabetes and use American ginseng. Schizophrenia (a mental disorder): High doses of American ginseng have been linked with sleep problems and agitation in people with schizophrenia . Be careful when using American ginseng if you have schizophrenia. Menstrual abnormalities can be caused in some women who are use ginseng in the long term, in these women breast tenderness may be another side effect particularly if the supplementation has been for a very long period of time. Nursing women and women in a term of pregnancy are advised against using the ginseng in any form.